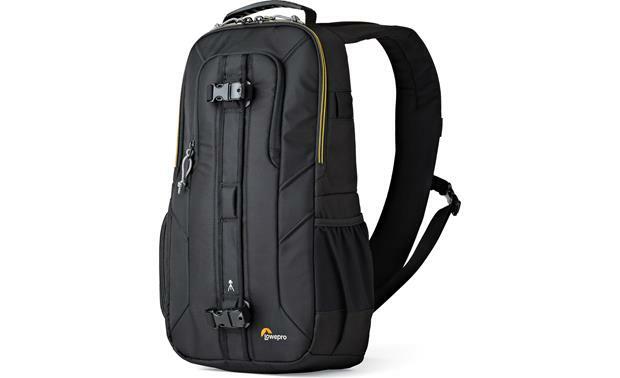 Even if you carry a lot of camera gear on your day trips, the Lowepro Slingshot Edge 250 AW has you covered. 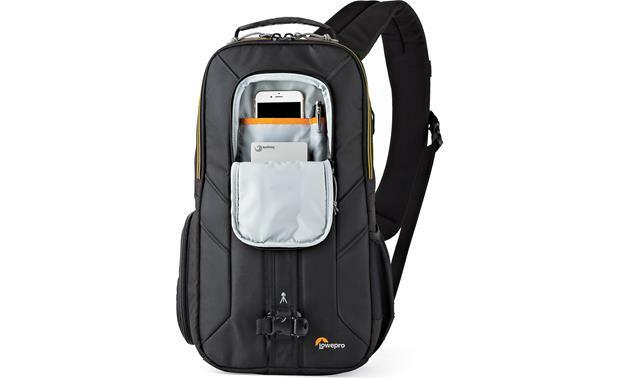 Wear it like a backpack while you're in transit, then slide it around your body for easy access to your camera when you spot a perfect scene. 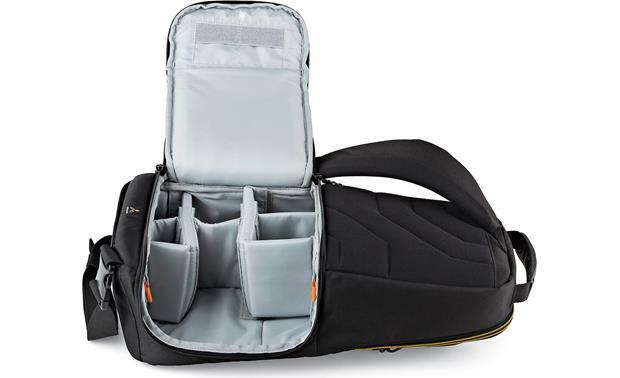 A specially-designed zippered opening offers side access to the internal compartment, where configurable, padded dividers keep your gear organized and protected. There's even room for a small tripod and a water bottle on the outside of the pack. 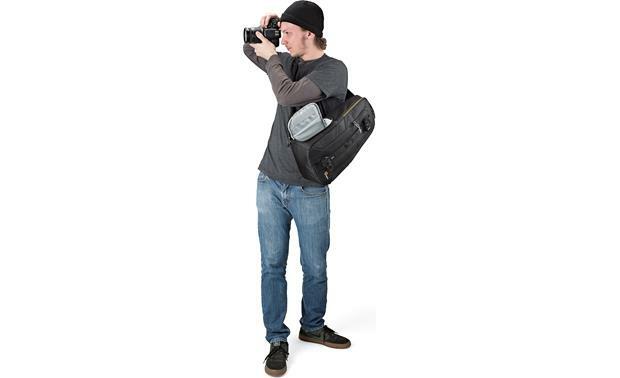 Overview: The Lowepro Slingshot Edge 250AW is a sling-style backpack for your smaller DSLR or mirrorless camera and accessories. 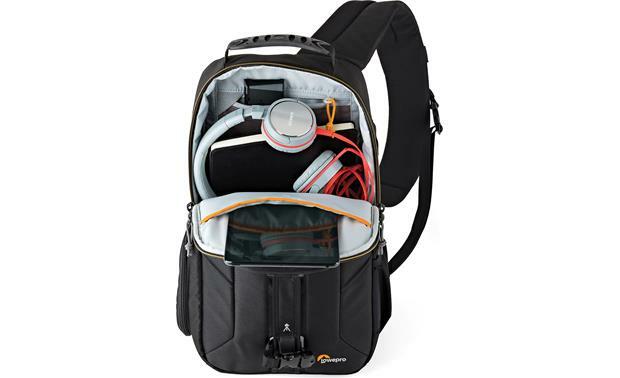 The backpack is divided into top and bottom compartments with separate openings. The Slingshot Edge 250AW can hold the camera with an attached lens, extra lenses and flashes, a tripod, and a tablet. Top Compartment: The top compartment features a zipper on three sides, allowing you complete access. Inside the compartment is a zippered pocket on the back for small items, such as batteries and cables, or a smartphone. At the front of the top compartment is the CradleFit pocket (7-11/16" x 9-1/16") for a tablet. This pocket is padded on the front and back to keep your tablet safe from impact. 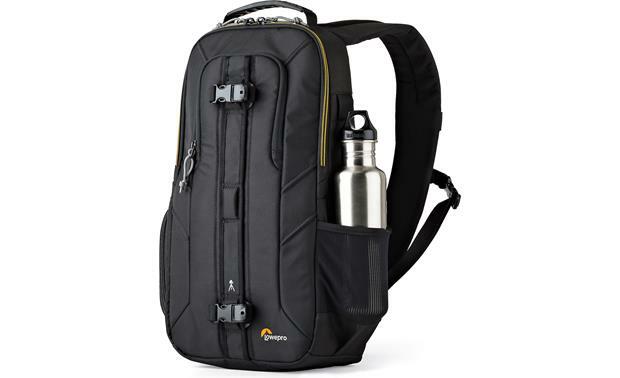 Bottom Compartment: The bottom compartment features side and rear access with a long zippered opening. The sling bag is designed so you can easily rotate the bag to the front and grab your camera from the side access. The side access flap has dual internal pockets for small items such as memory cards or batteries. If you need full access to the bottom compartment, you can remove the bag and fully open the compartment from the rear. You can customize the bottom compartment by configuring the padded dividers any way you desire. 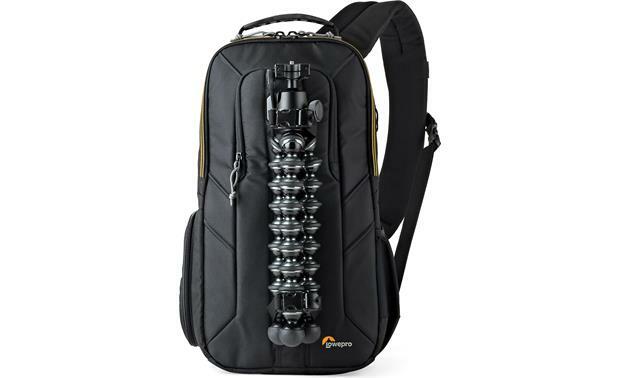 Tripod Straps: Two straps are provided on the front of the backpack for attaching a compact tripod. The straps are adjustable, and have quick-release clasps for easy removal. Exterior Pocket: The Slingshot Edge 250AW has a deep zippered pocket on the outside for storing personal items for quick access. Small internal pockets are provided for pens or pencils and a smartphone, as well as a clip for your keys. Side Mesh Pocket: A tall stretchy mesh pocket is provided on one side of the backpack to accommodate water bottles, snacks, or other items. 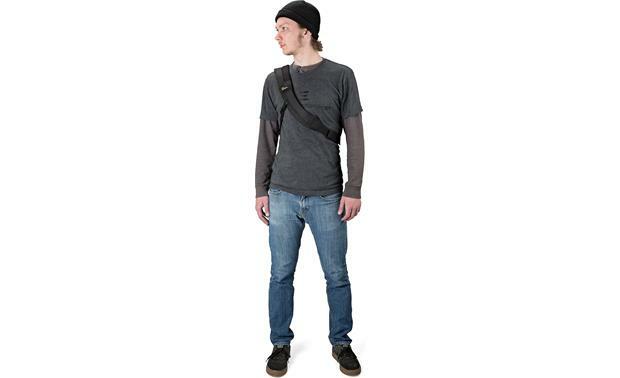 Strap/Handle: The backpack is equipped with a single 3" wide, adjustable padded shoulder strap for a comfortable fit. A rubber molded grab-handle at the top lets you grab the backpack and go. 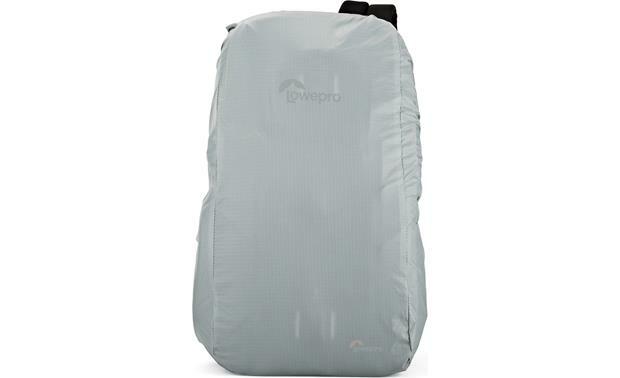 All-Weather Cover: The backpack features a full All-Weather AW Cover stored in the bottom pocket. When bad weather strikes, you can quickly and easily protect the entire backpack and all of its contents by pulling up the AW Cover. 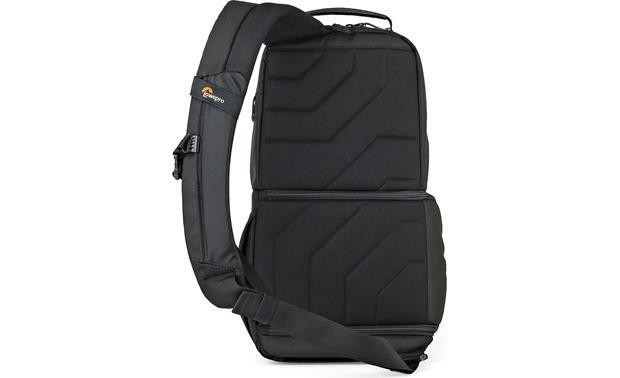 Internal Top 8.66" 9.06" 3.94"
Tablet Pocket 7.68" 9.06" 0.79"
Searches related to the Lowepro Slingshot Edge 250 AW Backpack for carrying camera and accessories.